I love to grab something like egg muffins for a quick breakfast, and Ham, Cheese, and Green Bell Pepper Egg Muffins in the fridge are a great way to start out the week! And this grab-and-go breakfast idea is low-carb, Keto, low-glycemic, gluten-free, and South Beach Diet approved. Use the Diet-Type Index to find more recipes like this one. 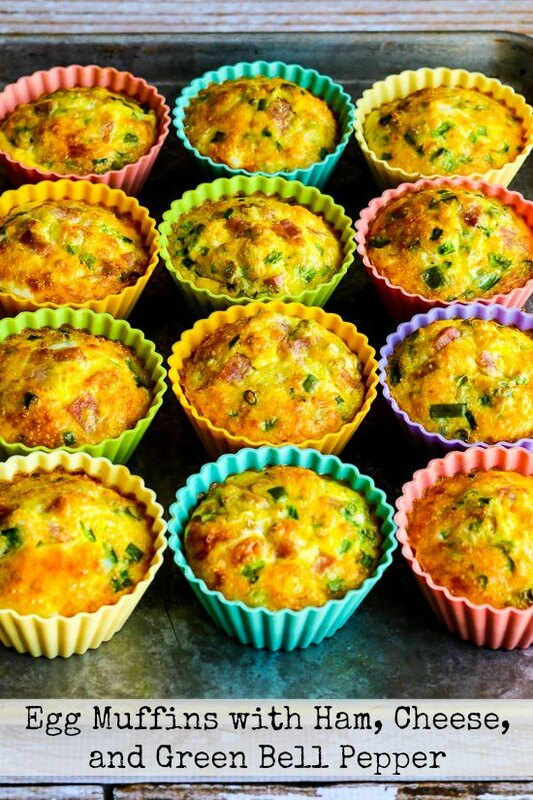 Click to PIN Low-Carb Egg Muffins with Ham, Cheese, and Green Bell Pepper! When it’s January, lots of people start making my Grab-and-Go Egg Muffins for an easy low-carb breakfast (and that post with the basic directions for Egg Muffins is well on the way to having 2 Million pins on Pinterest, wow!) You can see recipes for this type of egg dish all over the web now, but I first made them in 2005 and came up with the name Egg Muffins as a variation of something I saw in one of the South Beach Diet books. My basic recipe for egg muffins has infinite variations, so I haven’t posted too many individual recipes for the basic egg muffins, but I have shared a few recipes for combinations I make over and over like these Egg Muffins with Ham, Cheese, and Green Bell Pepper. I love the little bits of tender-crisp bell pepper in these, but you can use red pepper or another vegetable if you’re not a green pepper fan. 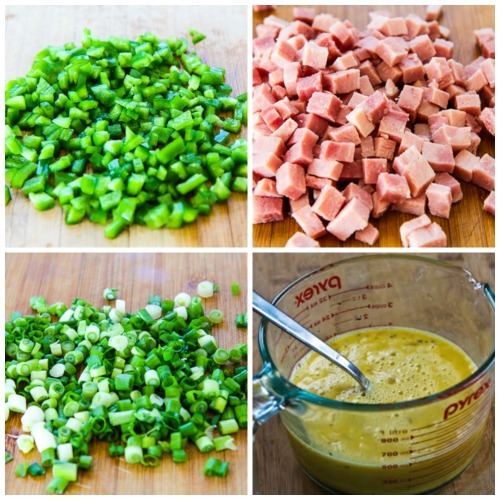 Finely chop the green pepper, chop the ham, and slice the green onions. Beat eggs well to combine. Put the muffin cups on a baking sheet and spray with non-stick spray. Fill each cup with some of the finely diced green pepper, diced ham, sliced green onion, and cheese. Then pour in egg, let it settle down, and fill with egg again, until the egg is almost to the top of the baking cups. Bake 25-30 minutes, or until the top of the egg muffins are browned to your liking. Egg muffins will keep at least a week in the fridge and can be reheated quickly in the microwave for a perfect easy breakfast. When I have a batch of these in the fridge I feel like I’ve got breakfast handled for a few days; enjoy! I love to grab something like egg muffins for a quick breakfast, and Ham, Cheese, and Green Bell Pepper Egg Muffins in the fridge are a great way to start out the week! Dice ham and green pepper and slice green onions. In the bottom of the the baking cups layer the ham, green pepper, green onions and cheese, dividing each equally among the 12 baking cups. Break eggs into a bowl or large measuring cup that has a pour spout, then beat eggs and Spike Seasoning with a fork until they are well combined. Take a small fork and gently “stir” to distribute the ingredients in the egg mixture. Egg muffins will keep well in the refrigerator for at least a week. I have frozen them, but the frozen ones release liquid when they are microwaved, so now I prefer to just store them in the fridge. I used Chambers Bay Baking Company medium silicone baking cups for the medium-sized egg muffins in this recipe. If you have small sized silicone baking cups, use this version of the recipe. 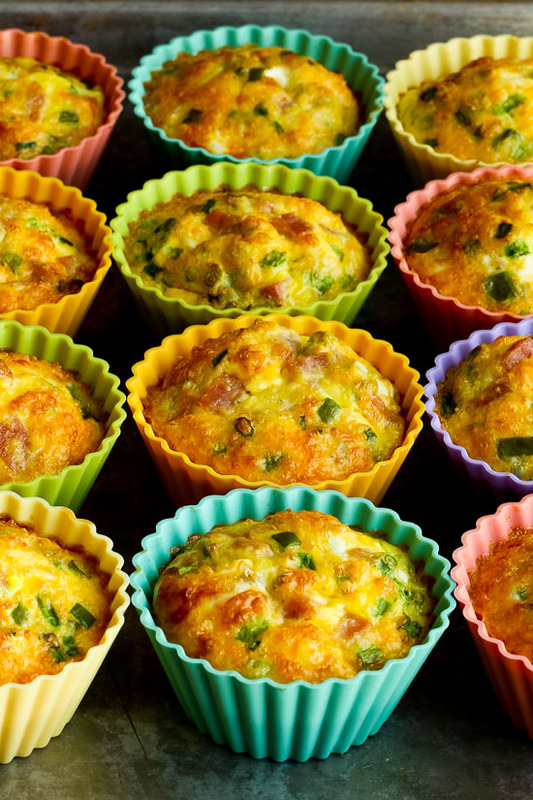 If made with lean ham and low-fat cheese, these Ham, Cheese, and Green Bell Pepper Egg Muffins would be approved for any phase of the South Beach Diet. They would also be a great choice for most other low-carb diet plans, many of which would prefer full-fat cheese. We love these! Question: I can only find the Chambers Bay cups in jumbo or standard. Can you advise which is the correct size? For most of my recipes I use the size they call Jumbo. But other sizes can work, the cooking time will just be a bit longer or shorter for different sizes. Here’s a post I wrote about silicone baking cups that might be helpful. Enjoy! That totally depends on your appetite. I only eat one (usually with something like a cheese stick on the side) but people with bigger appetites probably want two. Stacey it does talk about that in the recipe. You can freeze them, but they release a lot of water when they are thawed and personally I like them best just stored in the fridge and reheated. They will keep at least a week in the fridge. I clicked on the Amazon link but it didn't show the brand you recommended? Did I do something wrong? How do paper baking cups work? Do they stick? If you scroll down a little that page shows the Chambers Bay Baking Cups I used. (I wanted to give people options.) The paper cups won't work well; the eggs will definitely stick. The cups that are lined with metal might work, but I've always used the silicone ones. Thank for the egg muffin recipe. My son loves muffins and i'm going to make him a surprise. Thanks!! This is the answer to making my mom her egg McMuffin' low carb:):) I love your web site and ALL your recipes. I bought the SPike seasoning months ago, I find it salty tasking. I bought the 6 pk too.. I'm thinking just a silicone one piece muffin pan would work. Thanks! Hi Kathy, glad you are enjoying the recipes. Maybe try using less Spike; it does have some salt, although there's a salt-Free Spike too. Hope your mom enjoys this! Hi there! Searching for an easy quiche recipe to make for my daughter's wedding reception. This looks like a winner! Question: can I use paper bake cups and do you think I can bake and freeze for reheating later? Sorry to discourage you but I don't think paper baking cups will work well with this (the egg will stick to it) and they aren't that good when they've been frozen either. Sorry I could not help. just tried these for breakfast and they were great! making your spicy green chile mexi casserole for dinner. thanks for all they yummy recipes! Im a vegetarian, so I replaced the ham with tomatoes and mushrooms–its DELICIOUS. I love your cottage cheese and egg with ham and cheddar muffins that I've been making quite a while now. I need to get back to Phase 1South Beach so will have to try these. You can definitely make these with Egg Beaters. Has anyone tried making mini muffins with egg beaters???? These muffins are great to have when you want a tasty bite before running out the door. Viknh, what a great idea! I've been making your eggs muffins for a couple years now. I was alternating between them & hard boiled eggs, but peeling the boiled eggs was always a challenge. Now I "hard poach" the eggs in the silicone muffin cups, no peeling involved. (And much cheaper than the silicone poaching cups. )Thanks Kalyn! Pinos, thanks, good to know! I think the key point in this recipe is demonstrated in the cookie sheet placed under the silicon cups. Do not fill the silicon cups all the way on your kitchen counter, then try to transfer them to the baking sheet. Unless you are trying to feed your counter a nice healthy snack, in that case go for it! I finally wrested the cups into the oven and they are cooking as we speak. They smell yummy! Cee Jay, how fun to have fresh eggs. I keep wishing one of my neighbors would get chickens so I could buy the eggs, although I don't want to take on the project myself! I usually cook these in advance, but if you're cooking that morning prepping the ingredients in advance is a good idea. Even though hubby and I live in suburban Tampa Bay area, we are in an unincorporated section and are allowed to have chickens. With four hens, we have eggs a plenty, so I'm always looking for new recipes for eggs. I have made something similar to this as a big casserole, but never as individual stand-alones. I made these in ramekins, as I'm not much of a baker, and couldn't find my muffin tin. Prep and cook time was okay, but I think next time I'll chop the ham, onions and peppers the night before to save time. Hubby grabbed one on his way out the door to work. I'm eating mine now. 30 minutes was perfect bake time. I have made different variations of these several times. The are good with spinach or broccoli as well. I haven't ever had them puff up and leave a hole in the center. If I had to guess I would say maybe you beat the eggs too much, but not really sure why that would happen. Great breakfast idea and I love the muffin cups. I made these with mushrooms and cheese and they puffed up and there was a hole in each center, ever have this happen? Katie, they're going to become regular around here again too. The multi-colored silicone muffin cups were from Sur la Table if you want to try to order them. I love these and don't make them nearly often enough. And now I covet those pretty silicone muffin 'papers'. Happy New Year! I made a version of these last May and they are truly fantastic to have ready for rushed mornings. Thanks for reposting and reminding me how great they are. These are great! I've made a simpler, smaller version for weekend guests, but never thought of making them bigger (with more in them) for everyday. We frequently have to rush out early, with no time to cook and no time to eat out. This is the answer to a problem now solved! Jamie, glad you like the idea. Happy and Healthy New Year to you too! I love these! 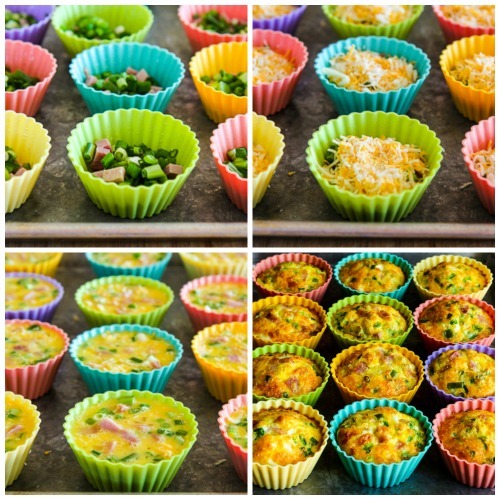 I would have never thought of making frittatas in muffin shapes which I find brilliant! Yes, easy to carry and also great for serving one single portion with salad for a nice light lunch. Great! And Happy and Healthy New Year, Kalyn! Joy, haven't had any problem at all with the cups being hard to clean. I do spray them with non-stick spray, but often wonder if I really need to. I remove the egg muffins from the cups when I store them. Kalyn, reviews of the silicone cups often state they are hard to clean, especially if you leave the muffins in the cups. Do you find that to be an issue and/or do you remove the muffin from the cups before storage. I love the recipe and plan to incorporate it in my morning routine. Thanks for all your recipes. You are a great resource! Carbzilla, I used the silicone cups and mine rose quite a bit, but I am guessing different brands of silicone cups might be different. Wouldn't hurt to turn the oven up a bit to see. Ben, glad you like it. Lydia, I do like the green chile and cheese ones a lot. I love the sound of the mushroom and thyme ones! Of all the variations I've made (which I learned from reading this blog! ), my favorites are the ones with a bit of something spicy, like hot sauce or jalapeño pepper. And instead of ham, I often add a small bit of non-fat cottage cheese. Thanks for including my mushroom and thyme egg muffins; they're another favorite, and the ones I make most often. I think the easiest way to stay on track throughout the day is to start the day off right! So it really is great that you're posting these. They sound like they have the perfect mix of saltiness from the ham plus veggies! I made your original recipe, and they turned out great. I have found that they don't rise as much in the silicone cups. With no liners, the muffins got huge (but then didn't come out of the pan easily, even though it'd been greased). I wonder if I should turn up the oven a little if I'm using silicone.